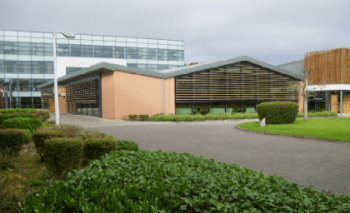 Garda College Dining Hall Extension – Duggan Brothers Ltd. This Project involved the extension & refurbishment of the existing Dining Hall, Kitchen, Servery and Gym to cater for the expanding student numbers at the Garda College, Templemore. The extension consisted of a steel frame with kingspan roof & extensive use of curtain walling and timber brise soleil to the facades. The project also included extensive mechanical, electrical installations replacement of finishes and new doors and windows. The existing kitchen and dining facilities remained fully operational at all times throughout the construction period without disruption. The project also incorporated a substantial site works package which included extensive areas of hard paving & soft landscaping throughout the live campus which was also carried out on a phased basis in order to minimise interference to college operations.